As a PLO sniper and Arafat's chauffeur, Saada was a Muslim immersed in anti-Israeli activity. 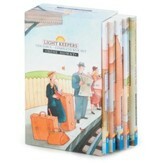 But when he reached middle age, he moved to America, began a family---and became a Christian! 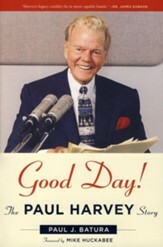 You'll be enthralled by his prophetic conversion and subsequent encounters with Arafat, his teaching about Arabs and Ishmael, and his hope for reconciliation through Jesus. 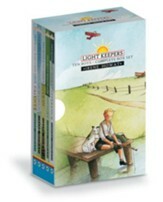 242 pages, softcover from Tyndale. At age 17, Palestinian Tass Saada ran away to become a PLO sniper, onetime chauffeur for Yasser Arafat, and a Muslim immersed in anti-Israeli activity. As a man he moved to America, started a family, and eventually became a Christian. 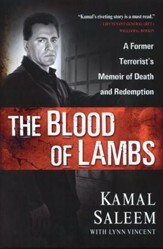 Then he risked retribution as he returned home to share his faith with his family and former boss. 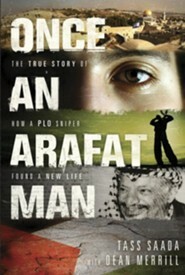 Once an Arafat Man is a story of the ultimate triumph of love over hatred, of reconciliation over divisions. Its a story that can inspire us all to overcome the conflicts in our own lives. 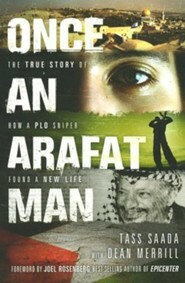 I'm the author/artist and I want to review Once an Arafat Man: The True Story of How a PLO Sniper Found a New Life, Softcover.